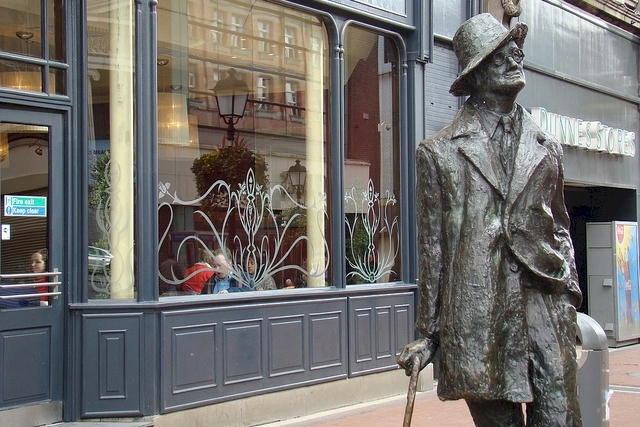 This is a stroll around central Dublin, concentrating on places that are associated with James Joyce or with the characters in his novels and stories. The route shown is about 3.5 miles in length and there are a lot of places to stop along the way, so real enthusiasts might like to split it over two days – one for the north side and the second for the south side of the Liffey. It is by no means a definitive Joycean walk (that would be considerably longer) nor is it a recreation of the walk taken by Leopold Bloom. We chose this route because even if you are not a hard-core Joyce fan it’s a good walk with plenty to interest you along the way. The tour starts at the home of Leopold Bloom at No. 7 Eccles St, which can be reached on the No. 10 bus from the city centre. Eccles St. is akin to a place of pilgrimage for many, but something of a disappointment as the house was knocked down some years ago, a private hospital stands in its place, but it once stood directly opposite No.76 on the other side of the street. A lovely Georgian building, built between 1802 and 1813, and probably one of the best Georgian buildings in Dublin. It is no longer a church and was for a time used as a party venue. The carved Greek inscription on the portico reads ‘Glory To God In The Highest’. In recent times some preservation and cleaning has been carried out, but it is not open to the public currently. 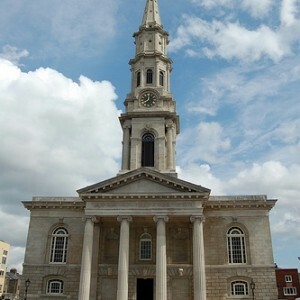 It would be wonderful to see it fully restored to its original state and to hear those bells pealing out again. C. Belvedere College, Denmark St.
An exclusive Jesuit school, where Joyce was a pupil on a scholarship. Stephen Dedalus, Joyce’s alter ego in Portrait of the Artist as a Young Man, struggles with feeling ashamed of his poor background while attending Belvedere and it was here he was terrified into vowing to live a life of purity after hearing a rousing sermon about hell. He was not long about abandoning the notion. D. James Joyce Center, Nth Great Georges St.
A useful stop to pick up some literature and learn a little about Joyce’s background and work. The original front door of No. 7 Eccles St is here, salvaged by a quick thinking Joyce enthusiast when the building was destroyed. 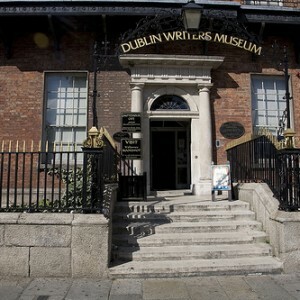 In addition to Joyce, the centre has a wealth of information and some fascinating exhibits about other writers with connection to Dublin and you will often find some special event going on. E. Parnell Statue, O’Connell St.
Keeping guard at the top of O’Connell St, Charles Stewart Parnell was the leader of the late 19th century Home Rule movement, which demanded a measure of self-government for Ireland. He was an heroic figure at the time, but was brought down by a scandal over a love affair with a married woman. Joyce was greatly influenced by his ideals and his story, and he appears over and again in his writing, notably at the Christmas Dinner scene at the start of Portrait of the Artist as a Young Man. 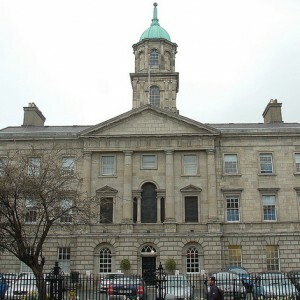 F. Rotunda Hospital, Parnell Sq. 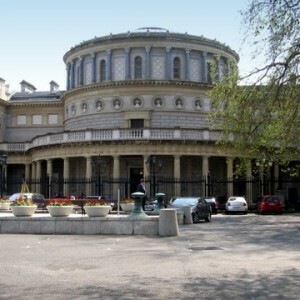 The Rotunda has been a maternity hospital since 1745, the first such hospital in the world, and has delivered many of Dublin’s babies every year since. as Bloom passed while attending the funeral of Paddy Dignam, who died in a drunken stupor. A fascinating repository of artefacts, portraits and information about Dublin’s many writers. James Joyce is in there of course, but also Oscar Wilde, Jonathon Swift, Samuel Beckett, W.B. Yeats, Patrick Kavanagh and many more. The building is a wonderful example of Georgian architecture and is worth a visit in itself. H. Gresham Hotel, O’Connell St.
A well-known hotel which was from its beginnings in 1817 until quite recently an important centre of Dublin social life. “His soul swooned slowly as he heard the snow falling faintly through the universe and faintly falling”. 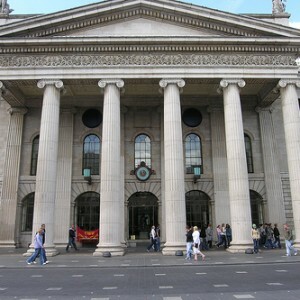 I. GPO (General Post Office), O’Connell St.
“Under the porch of the general post office shoeblacks called and polished“. This was also the place where “trams slowed, shunted, changed trolley, started for Blackrock, Kingstown and Dalkey“, though Joyce marked the location with reference to Nelson’s Pillar, which stood opposite from when it was built in 1808, to honour Admiral Nelson following the Battle of Trafalgar, until it was blown up in 1966. The GPO was also the central site in the Easter Rising of 1916, and the place from which Padraig Pearse read the Proclamation of Independence. 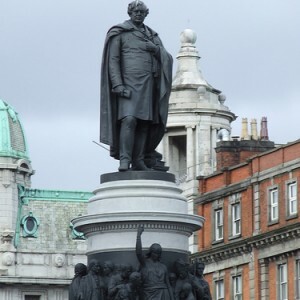 J. O’Connell Monument, O’Connell St. Standing dramatically overlooking the entrance to the street which bears his name, Daniel O’Connell was the leader of the Catholic Emancipation movement in the early 19th century, campaigning for Catholics to be allowed to vote. It is worthy of remark. In this picture though, a bird perched on O’Connell’s head has made a different kind of comment! While there he see Dilly Dedalus at Dillon’s auction house and presumes she has been trying to sell her impoverished family’s possessions. Dillons was one of several auction houses that once operated in this area, all now closed. There is a wonderful bookshop along here though, The Winding Stair”, that is worth dropping into. You can walk back to O’Connell Bridge on a boardwalk by the river. As Leopold Bloom crossed the bridge he bought some Banbury cakes from a street trader to feed to the gulls. 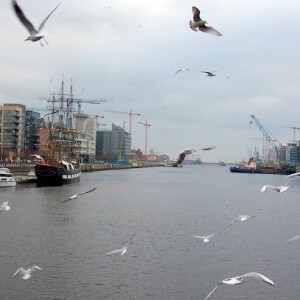 You’ll still see plenty of greedy gulls here, but the views from the bridge are much changed since Joyce’s day. O’Connell Bridge was originally built in the 1790s but was widened in 1888 and is now almost an exact square, as wide as it is long. The Bridge is the main crossing point between the north and south of the city, so if you are splitting this walk over two days, it’s the end of part one. 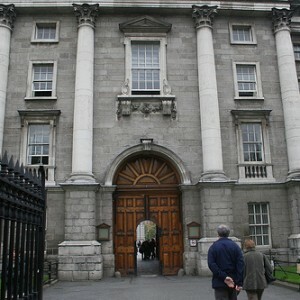 After crossing O’Connell Bridge, walk up Westmoreland St towards Trinity College. This was the street where Leopold Bloom’s taste buds were aroused as he passed Harrison’s Restaurant, now long gone. Bloom thinks as he passes the bank. Once the seat of the Irish Parliament, it was a bank by Joyce’s time, and was where Stephen Dedalus went to cash the prizes he won at Belvedere College, with the intention of treating his family to various expensive gifts. 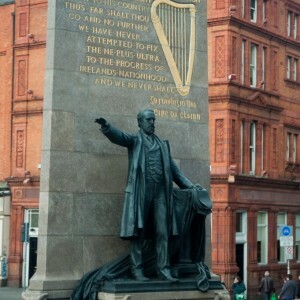 As you cross the road to Trinity, look out for the statue of Thomas Moore on the traffic island. Thomas Moore was famed for his songs, collectively known as “Moore’s Melodies”. One of the best loved was “The Meeting of the Water”, about a place where two rivers join in Co Wicklow. At the time there was a urinal in this area. Alma Mater of many Irish writers, including Swift, Beckett, Wilde and Goldsmith, but not of Joyce. As a catholic he would have been forbidden to attend without permission from his bishop, which was virtually impossible to get. He probably never passed through those doors, but you should. 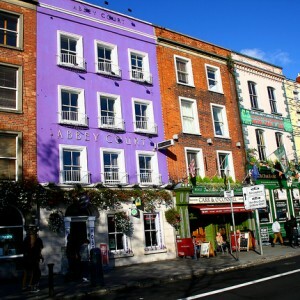 Many consider it to be the finest house in Dublin, and certainly No 1 Grafton St is an unbeatable address. 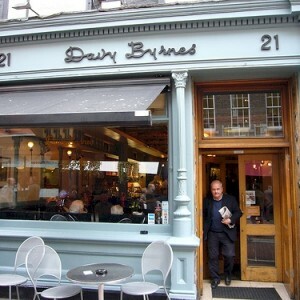 This was where, in 1904, James Joyce met his future wife, the red-haired Galway girl, Nora Barnacle, and asked her for a date. It’s a good street to do some shopping for souvenirs to-day. Though some of the shops are a bit overpriced, the long established Kevin & Howlin is a good place to buy tweed and woollens. This was where Nora Barnacle worked as a chambermaid. It’s a long time closed, but if you stand on Clare St you can still make out the name written on the gable end of the building. Look out for this as you near the top of Nassau St.
Not only is Sweny’s Pharmacy still there, it has changed little and still has its black-and-white exterior and an interior crammed with potions and vials. And yes, like Bloom, you can buy handlotion and lemon soap! Number 1 Merrion Square, the first house on your left as you turn into the square, was where Joyce arranged to meet Nora Barncacle for their first date. She stood him up. It was also where Oscar Wilde’s father, a doctor, practiced. 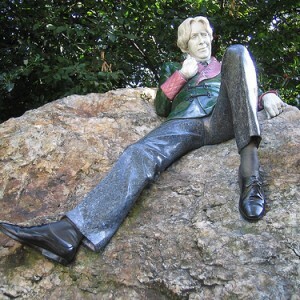 Inside the gate of the park opposite that house is a rather unusual statue of Oscar Wilde, lolling on a rock. As many people hate this statue as love it – make up your own mind! There are many other literary and historic associations here, including No. 58, former home of Daniel O’Connell, Nos. 52 and 82 where W. B. Yeats lived and No 84 which was the office of George Russell (A.E.). 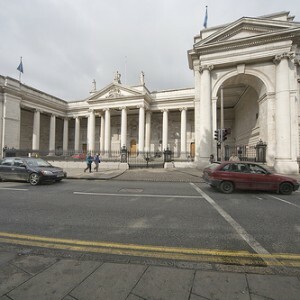 The National Art Gallery, where Bloom and Stephen pass briefly in the entrance portico, has several portraits of Irish writers and other notable figures and is worth a visit. At the other end of Merrion Sq (but not worth detouring to) is The National Maternity Hospital, known commonly as Holles St Hospital, where Bloom visited the unfortunate Mina Purefoy,who had been in labour for three days! 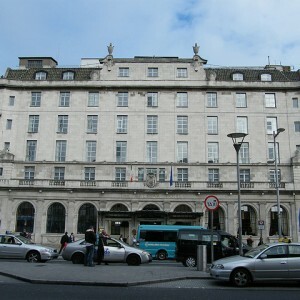 The hotel opposite, The Shelbourne, is mentioned several times in Joyce’s books. 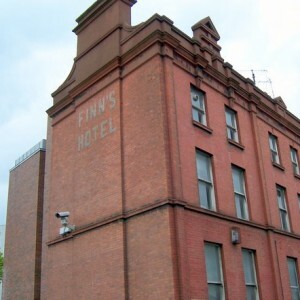 Then, as now, it was an expensive hotel and a popular place for well off Dubliners to socialise. There is a bust of James Joyce in the Green and it is a very pleasant place for a picnic or an alfesco lunch on a sunny day. 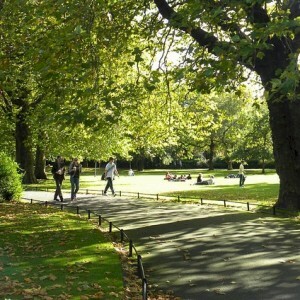 If you are going to have a picnic, pick up some food at one of the many shops and delis on Baggot St after you leave Merrion Sq. 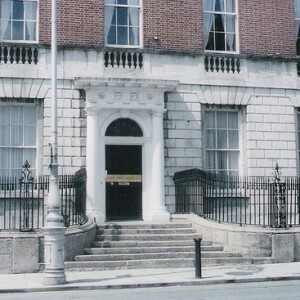 S. The National Museum, Kildare St.
Bloom detoured into the museum to avoid a meeting with his wife’s lover, Blazes Boylan, who he saw coming down the street. While there he expounds to a captive audience of Dublin intellectuals on his theories about Shakespeare and Hamlet. In Ulysses Bloom helped a blind man across Dawson St and into Molesworth St.
“He touched the thin elbow gently: then took the limp seeing hand to guide it forward. The plaque pictured is set into the pavement where they crossed. 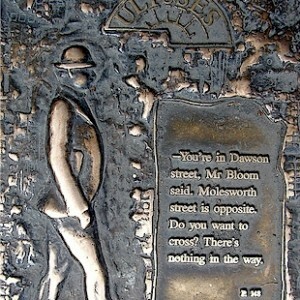 It is one of several such plaques at various points of Leopold Bloom’s walk, keep an eye out for them as you go. Bloom stopped here for lunch – a gorgonzola sandwich and a glass of Burgundy wine. The pub is still going strong and you can order the same lunch to-day, but it will cost you a lot more than Leopold Bloom paid! Look out for another plaque set in the pavement outside. Leopold Bloom thought about buying a pin cushion for Molly. 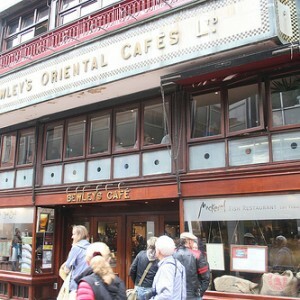 By now you are surely in need of a cup of coffee, so this is a good place to finish your tour. I visited Dublin recently and in your informationI was disappointed to see no mention of no. 64 Shelbourne Rd outside which there is a plaque showing that Joyce lived there in the early 1900s. My mother lived at no. 66 as a child during that same time and I have a newspaper cutting showing a copy of a letter dated 1904 which he wrote to Nora. The address shows 60 Shelbourne Rd! It is in fact No. 60 Shelbourne Road that Joyce lived in, I currently live in this house myself.